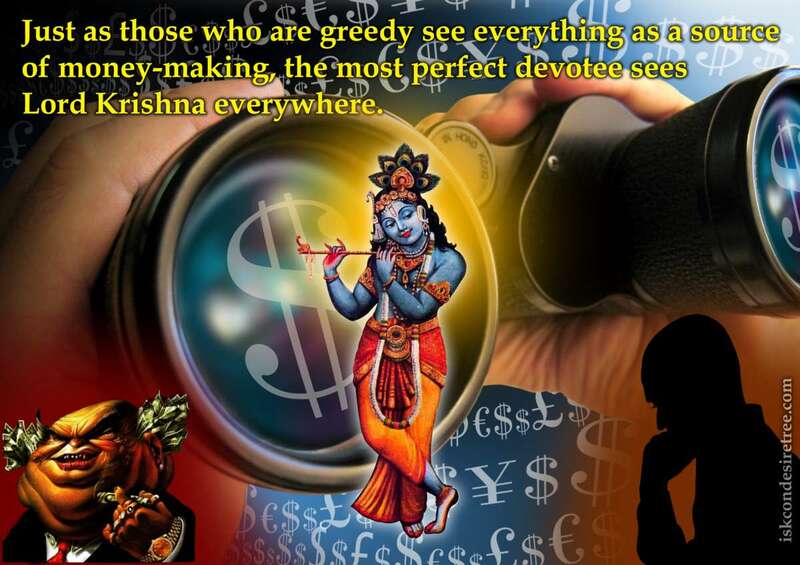 Just as those who are greedy see everything as a source of money-making, the most perfect devotee sees Lord Krisna everywhere. Nobody can see Krishna, who is both omniscient and omnipotent, with mundane vision. Our eyes must first be opened with the torchlight of knowledge. Wherever bona fide knowledge is cultivated, the darkness of nescience is banished. It is not difficult for the Supreme Lord to arrange for someone who loves Him to see Him, and also to take His association. Darshan should be taken not with the eyes but with the help of ears as "Darshan through Hearing" makes one fearless. In advanced stage, one could see the form of the Lord right in front of their eyes as a result of chanting. Ointment is applied to the eyes for clear vision. When the ointment of love of Godhead will be applied in our eyes, then with these eyes we shall be able to see God. God is not invisible. Simply like a man with cataract or any other eye disease, he cannot see. That does not mean the things are not existing. God is there, but because our eyes are not competent to see God, therefore we deny God. However, God is everywhere.